CHICAGO (Jan. 10, 2019) – The Washington Spirit has acquired the No. 3 overall pick in the 2019 NWSL College Draft via trade from Sky Blue FC. In exchange, Washington sends the No. 29 selection in today’s draft and three players to be named later to Sky Blue FC. 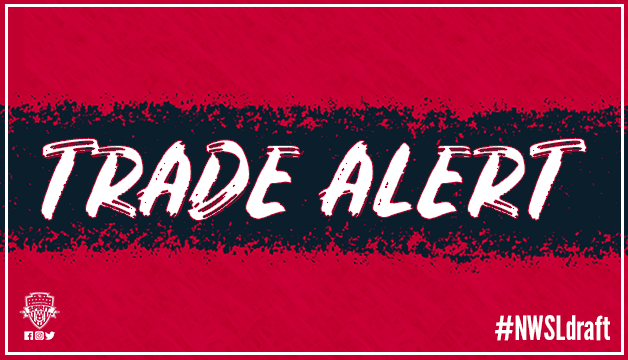 With the trade, the Spirit holds five total picks entering today’s draft, including four selections in the first round at 3rd, 4th, 7th and 8th overall. Washington also holds the 31st selection in the fourth round. % The Washington Spirit acquired the No. 3 overall pick in the 2019 NWSL College Draft via trade from Sky Blue FC in exchange for the No. 29 selection in the 2019 draft and three players to be named later. & Washington acquired the Orlando Pride’s natural first-round pick in the 2019 NWSL College Draft and Aubrey Bledsoe in exchange for Shelina Zadorsky. * Washington acquired the No. 7 overall pick in the 2019 NWSL College Draft via trade from the Chicago Red Stars, in exchange for the No. 20 overall pick in the 2019 College Draft and the Spirit’s natural first round selection in the 2020 College Draft. ^ Washington acquired Portland Thorns FC’s natural first-round pick in the 2019 NWSL College Draft in exchange for a 2018 international roster spot and future considerations. ### Washington acquired the Houston Dash’s natural fourth-round pick in the 2019 NWSL College Draft in exchange for Tiffany Weimer.